In an attempt to balance "The Early Days" we felt there was a need to document the arrival of Airwomen at 2 Wing in 1953. While the amount of detail available is limited, we feel that we will be able to gather more information as the word spreads to those Airwomen who served at Grostenquin. 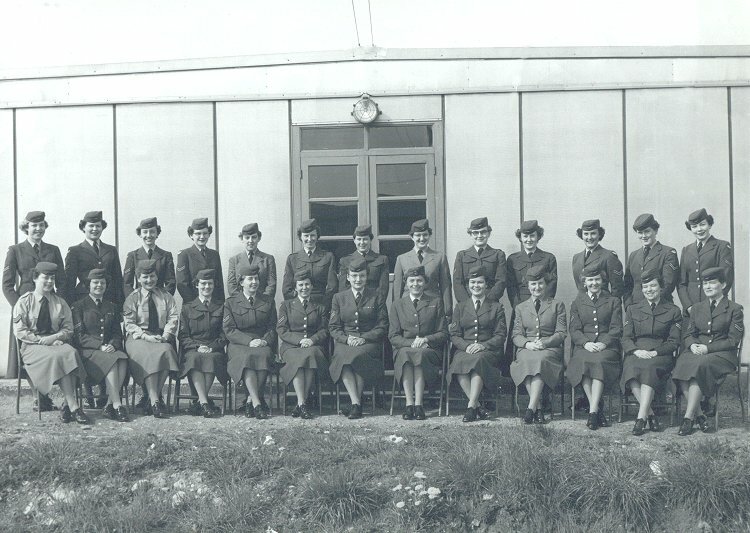 Can you help us out by providing detail pertaining to the "Original Draft" of Airwomen that arrived at Grostenquin in March 1953? Click on the description text to view the article. SSTS Course #4 (for Airwomen) was held at 2 Wing with attendees from all of the Wings as well as Air Division HQ - May 1955. Courtesy Connie Olson (now Teed). Larger image of Airwomen on SSTS Course #4 - May 1955. 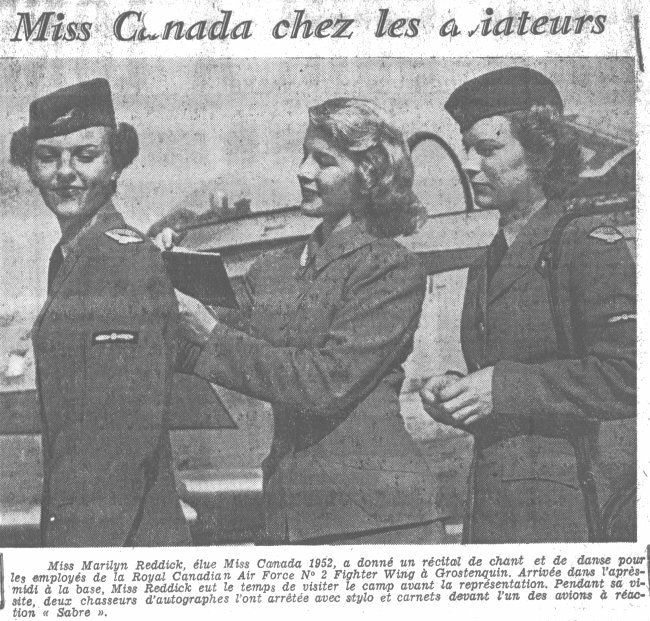 Marilyn Reddick (Miss Canada 1952) and two unidentified airwomen - 8 June 1953. 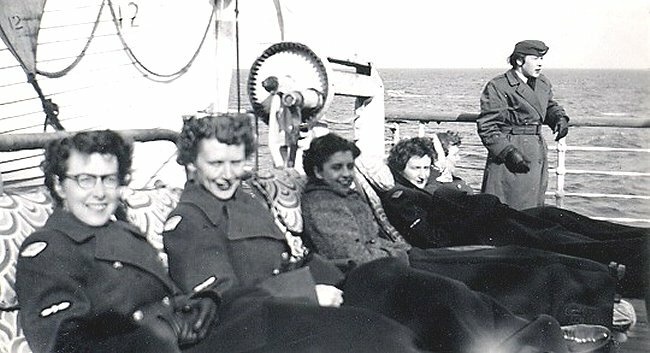 Airwomen on the RMS Ascania heading towards France. (L-R) Flo Kerr, Audrey Blackmer, Eunice Reinboth, Cec Anderson, Joan Mullen, Gertie Dunn - March 1953. Courtesy Flo Kerr (now Brewer). Courtesy Dorine Weagle (now Roberts). A group of fifty Airwomen on Parade, addressed and inspected by Air Vice Marshal Frank G Wait at No. 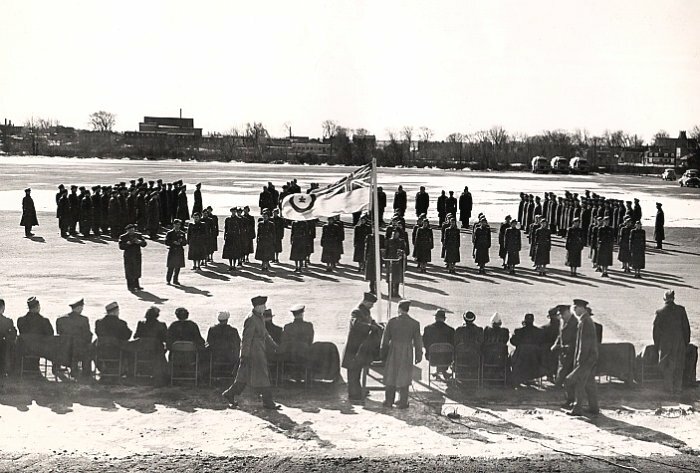 1 Personnel Reception Centre in Lachine Quebec - February 1953.